I was shopping for my niece at Zappos when I came across these super cute wittle bitty swash Vans. I wore Vans all the high school....and beyond. Was probably one of the first in my school to get them once we saw Fast TImes at Ridgemont High. I love their colors and styles. I would be wearing them right along with Hadley today IF my old man feet weren't so destroyed from WEARING VANS for so many years. Flat soles, no arch support can kill a rad dude-used-to-be. I hope Hadley realizes what she's gotten her feet into....in a year....when these fit her. 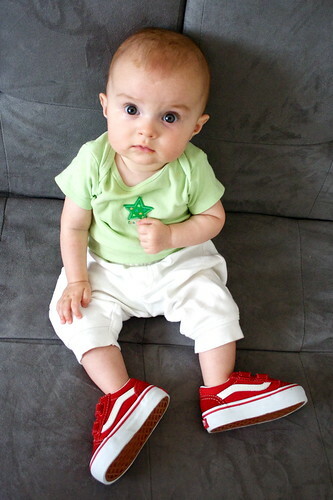 I had a similar response to Nathan's first pair of Chucks. They were red, and he called him his clown shoes. That is the cutest thing. Her feet look huge. And she is looking at you in complete dismay. "Daddy, what are these huge things on my feet?" I remember your Vans - so cool! Yankton, SD was never the same again!